I appreciate the reminder to not take for granted that I have another day to sing and pray, to write and paint, to be with family, to help a friend. “Day by day, oh dear lord, three things I pray . . .
1971 Original Broadway Cast Recording. George Harrison’s epic song, My Sweet Lord, entered my life at the age of twelve, and remains, to this day, one of my favorite meditations, at sunrise or any time. Singing mantras and hymns in the early morning hours, along with japa meditation, is the way I start each day. Do you have a favorite song that inspires your day? 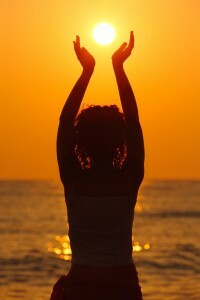 Do you have a sunrise ritual, prayer or meditation? Please share it in the comments below.